Dear Neighbors: We heard the very sad news from a few neighbors that Paul just recently passed away. He clearly was (and will continue to be) a wonderful presence in the neighborhood who will be missed dearly. Our condolences to Paul’s family, friends & everyone who knew him personally. The weather sure looks pretty blah out there folks. Perfect morning for an Alexander’s breakfast. We sure do love our Bongo Room, Vincent and m.henry mimosa brunches, but it is comfort food mornings like this that make us really appreciate all the family owned and operated neighborhood joints right here in Edgewater Glen. They have been around for 54 years and are still going strong! 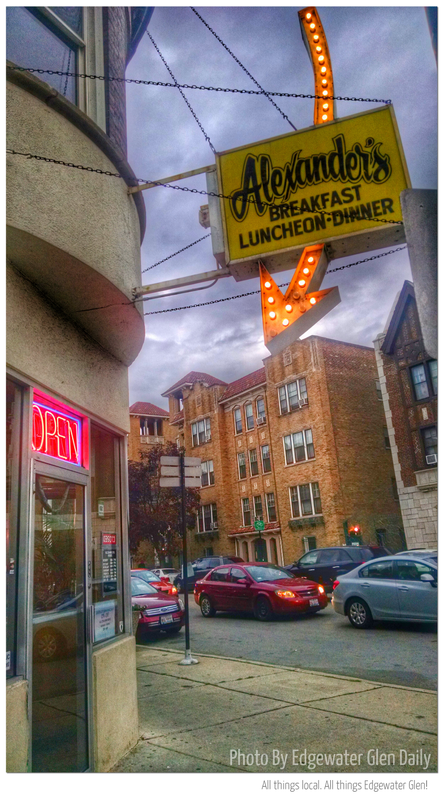 Alexander’s is nestled between The Highlands of Edgewater & Edgewater Glen on our northwestern most corner (at Clark & Granville). If you haven’t had a chance to yet, stop in and say hi! You might also checkout their fantastic Yelp reviews or have a Google Maps look inside their old school awesomeness.